One day early in 2006, the father of 6 year old Bogi Petersen from the Faroe Islands saw a TV-ad from McDonald's about a contest where the lucky winner would become a mascot in a soccer match at the World Cup in Germany 2006. The father then rushed to the computer and entered the name of his son, Bogi, - and forgot all about it! 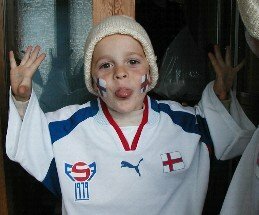 Photo above: Bogi Petersen, 3 years old in 2003, in a Faroe Islands replica soccer jersey, ready for a match against Germany! Then one day in late April, when Bogi's mother checked if there was any new email, there was a message from McDonald's waiting in the inbox. "What on earth is this", she thought. She was asked to call McDonald's, because they apparently had some good news for her. Well, she called and the voice at the other end said that Bogi was the lucky winner of McDonald's World Cup player-mascot competition and that he would be holding the hand of a famous soccer player from either Brazil or Croatia, when they enter the field in the World Cup match at the Olympia Stadion in Berlin on June 13, 2006. But Bogi is no stranger to soccer and the big stars. 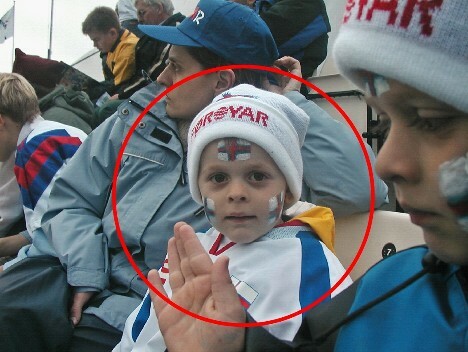 On the picture below he is attending a soccer match between the Faroe Islands and mighty Germany (June 11, 2003) in a qualifier for the European Championship in Portugal 2004. 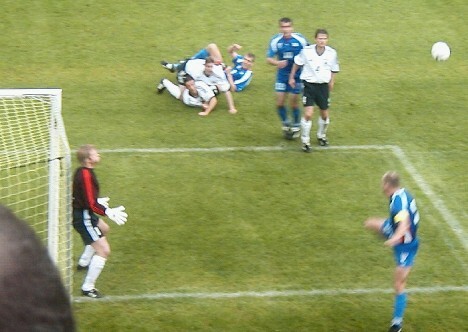 The Faroes fought bravely and held Germany from scoring for 88 minutes, but then Germany scored 2 agonizing last gasp goals. These pictures above are from 2003. Bogi was then only 3 years old. But little did he know that he would have another rendezvous with Germany 3 years later. – And this time, not only as a spectator, but actually entering the field in a World Cup match, holding the hand of a famous soccer player from Brazil or Croatia and leading him on to the pitch in front of 74,200 spectators and tens of millions of television viewers all around the world. Well, that puts things in perspective, doesn't it? In the village of Skálavík, where Bogi lives, there are less than 200 inhabitants. If they all had a seat at the Olympia Stadion, there would still be 74,000 seats left! Actually they could fit the whole population of the Faroe Islands in the Olympia Stadium and there would still be 24,000 seats available, as there only live about 50,000 people in the Faroe Islands. But first on the agenda is the World Cup match between Brazil and Germany, where Bogi – as a mascot - will be the first Faroese to ever to enter the pitch at the World Cup finals. The match is on Tuesday, June 13, 2006 at 8.00 p.m. British Summer Time, 9.00 p.m. Central European Time.